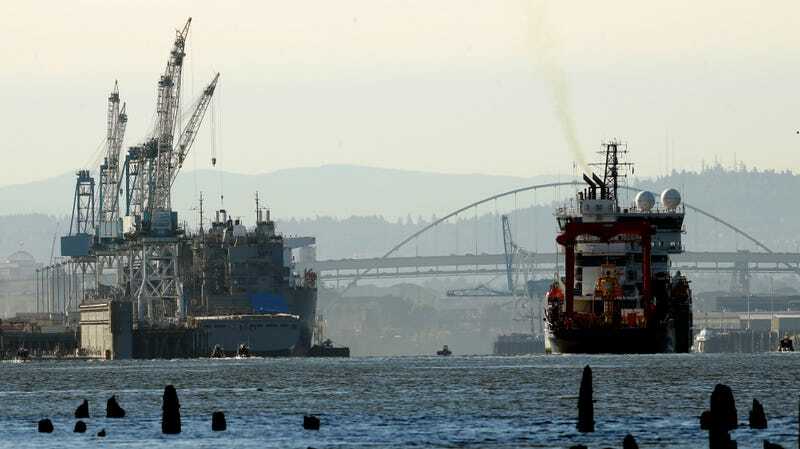 Royal Dutch Shell PLC icebreaker Fennica, a vessel designated to conduct exploration and spill-response duties for Shell, leaving port in Oregon in 2015. In a major blow to the Donald Trump administration’s oil and gas policy, on Friday a federal judge ruled the president’s order opening massive swathes of the Arctic and Atlantic oceans to oil and gas drilling operations illegal, the Washington Post reported. According to the Post, U.S. District Judge Sharon Gleason’s decision impacts around 98 percent of the Arctic Ocean, but only “undersea canyons in the Atlantic, as opposed to the entire Eastern Seaboard” (roughly 5,937 square miles deemed important to wildlife including “marine mammals, deep-water corals, valuable fish populations and migratory whales”, the Associated Press wrote). The judge found that while the president has the power under the Outer Continental Shelf Lands Act to withdraw leasing permits, that office cannot unilaterally grant permits without the approval of Congress. Opponents counter that the federal government has provided millions in funding to give town residents alternative forms of transport, and warn that a road would fragment critical habitat. They also cite expert testimony that any road through the refuge would be impassable during snowstorms. “Here, [former Interior Secretary Ryan Zinke’s] failure to acknowledge the change in agency policy and his failure to provide a reasoned explanation for that change in policy are serious errors,” Gleason wrote. Another federal judge ruled earlier in the week that the Trump administration failed to perform a serious analysis of environmental impacts when it approved two gas drilling operations in western Colorado, the paper added, while earlier in March another ruling halted a 300,000-acre gas and oil lease in Wyoming over a failure to consider its potential impact on the climate. According to the New York Times, the White House has lost about 40 environmental cases in federal courts under Trump. Industry officials, for their part, say that the Arctic and Atlantic ocean plans can proceed as the case works its way through the federal appeals process, the Post wrote. There’s also the possibility some of these cases will make it to the Supreme Court, which is dominated by a Republican majority and is likely to rule more in line with the White House’s wishes.